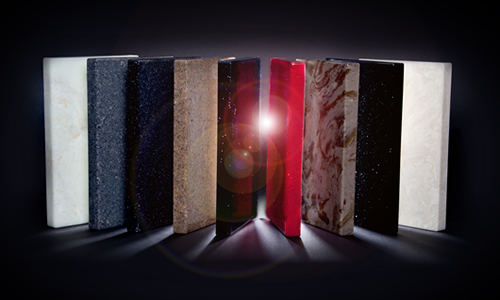 Versital is a beautiful high quality solid surface made to order in a huge range of colour options including imitation marble, granite and sparkle finishes. You may well have lots of questions to make the most of it. Versital has numerous applications included domestic bathrooms and commercial installations. To help you we have included our most frequently asked questions. If the answer isn’t here, please call us direct on 01204 380780. Where can I buy Versital Solid Surface? As a bespoke manufacturer, whether you are a Domestic or Commercial customer, you can purchase Versital from us direct. We do also work alongside numerous designers, architects and installers so may be able to recommend someone in your area if you ask us. Please call us direct on 01204 380780, or drop us an email to sales@versital.co.uk . How do I clean and care for Versital? In day to day use, wipe off dust with a fine cloth and use a soft cloth and mild surface cleaner. This can be as simple as a gentle washing up liquid. Finish by using a proprietary window cleaning spray and buff with a clean cotton cloth. Never use abrasive or corrosive materials or cleaning products to clean Versital surfaces. This includes cream cleaning products such as the likes of Cif, or anything gritty or abrasive. The use of Acetone, paint thinners or similar can cause damage and marks to the gel coat and should never be used. For deeper marks or to bring Versital back to it’s original glory follow this step by step video guide to re-polish Versital. How can I best view Versital colours and finishes? We strive to make sure the colours shown both online and in our brochures are as close as possible to the finished product, however it is not always possible to get an exact colour match. Deviations in colour can sometimes occur during the photography process or due to variances in computer screen display settings. We therefore recommend ordering colour samples from our website free of charge to view them in the comfort of your own home. Are dark colours suitable for all situations? All Versital colours and finishes are available in the full range of products manufactured. However, darker colours are not necessarily the most suitable option for high traffic areas such as hospitality table tops and bar tops, as given their nature they will inherently show up marks more readily than lighter colours. Speak to a member of the Versital team for help and advice on the most suitable colour options for your needs. How do I install a Versital Shower Tray? Installation of Versital shower trays is straightforward – you install them in the same way as any other stone resin shower tray. What is important to remember is that being made from a heavy stone resin, is it essential that the shower tray is fully supported on a strong base of either a platform or floor. Versital trays, floor slabs and drying areas should always be bedded down onto sanitary grade silicone. DO NOT use cement, sand or other system to bed the tray onto.If the tray is not fully supported or bedded down incorrectly it can lead to issues such as warping, sagging or even cracking of the tray/floor. Trays and all Versital surfaces should be installed using sanitary grade silicone and not any other type of adhesive or cement. Versital shower trays can be used in conjunction with either tiling or ideally Versital shower panels. Can I cut and scribe Versital? Many of Versital’s products can be cut and scribed easily on site during installation simply using ordinary wood working tools. Being a cast product however, it is important to remember that any cut edge will then become raw and will no longer be protected by the gel coat and polished finish. Once cut this surface cannot be polished back to how it started. This will need to be butted up to another piece of Versital, or an edge of other material, e.g. when scribing a top we would recommend butting the cut edge against a wall. This is ideal for installing panels and tops where scribing is required for a perfect fit. It is not recommended to cut shower trays to size to fit an area, and we would instead recommend using our bespoke shower tray service. I am working on a large project - can I place my order in stages? We would recommend ordering items of the same colour at the same time where possible. Versital is a luxury hand-made product using natural minerals and pigments. Due to the random nature of some of the natural fillers, there may be slight variations in the colour within small tolerances. Small samples are to be used as a colour guide only. This will in no way detract from the beauty and quality of your Versital item and will not affect its longevity. Versital is hand made to order in batches, so it is recommended to order in the same batch where an exact colour match throughout a project is important. How heat resistant is Versital? Versital is a very durable material that can withstand fluctuations of temperature expected in a general domestic and commercial setting. However, it is not recommended to use in areas of extreme heat such as next to ovens, kitchens and high heat areas. If it is to be used in conjunction with extreme temperatures please ensure you protect Versital with a heat matt or similar. Exposure to extreme temperatures could cause Versital to be marked. What should I do if I chip or scratch the surface? Please call our technical support helpline 01204 380780 and we will be able to talk the problem through with you and give the best advice. The good news is that most chips and marks are repairable and we are able to supply repair kits where needed. We recommend to follow this step by step guide video guide for carrying out a repair before carrying out any work. What surfaces can Versital be fixed to? Versital solid surface can be fixed to most surfaces, including plasterboard, plywood, plasters, tiles and so on. Prior to fixing, you must ensure that all surfaces are free from grease, dust and grime. Back surfaces only should be cleaned with acetone and be perfectly dry before silicon is applied. Versital can be fixed onto studwork that is clad in one of the materials listed above. Can I use Versital wall panels in the shower? Yes! Versital is the ideal surface for use in the shower, wetroom or steamroom. It can be made in sheets up to 3m long, has no joins and seams and is easy and hygienic to keep clean. This is your chance to have the marble or stone shower you have always dreamt of. Unlike the natural material, Versital imitation marble does not suffer from watermarks, is exceptionally stain and scratch resistant and is warm to the touch. Please ask for further details. I have an unusual shaped worktop and basin that I want Versital to fit exactly. Can you manufacture from a template? Yes we can. If you sketch your template either on MDF or a paper template then we can manufacture using this as our guide. Versital is cast and gives us lots of freedom to manufacture whatever it is you want, to whatever designs you give us. We are very used to working alongside designers, specifiers and architects and working from their plans also. What adhesive do I use to fit Versital? It is very important that you only use sanitary grade silicon when fitting Versital. DO NOT use liquid Nails or other “instant” type adhesives. We can supply this at the same time as your Versital order on request. Please ask when placing your Versital order. A standard tray just won’t fit – do you make made to measure trays? Yes we do. Versital manufactures a large range of standard trays. You can get an instant quote for a bespoke shower tray here on the website. Alternatively, please feel free to contact us directly to help you with any queries by filling in the details of what you require on a contact form. Don’t forget to include dimensions and you can also email a drawing if you have one. As always, please call us on 01204 380780 if you need to. What tools do I need to install Versital? If you are at all unsure what tools to use for the job, or would like advice on fitting and a fitting guide, please call us on 01204 380 780. What Safety equipment should I use for installing Versital? Protective clothing if necessary, including aprons, safety shoes, long sleeves etc. This list is by no means exclusive. Please do use any safety equipment and use any precautions you feel are necessary to protect yourself when using Silicone and tooling. How do I store Versital prior to fitting? Wherever possible Versital benefits from being stored flat. If Versital cannot be stored flat, support it with a sheet of flat 18mm by 25mm ply, inclined against a wall. If large quantities of Versital are stored frequently you could consider the construction of an ‘A’ frame support. It is very important that Versital is not left leaning unsupported at any time or with items on top of it. Ensure the protective film stays in place for storage and only removed for fitting. Is everything Versital makes fully bespoke and manufactured to order? Yes. Every single item that Versital manufactures is completely bespoke and manufactured to order. We keep lead times to a minimum with well organised production. This gives you the flexibility to order the exact shape, size and colour of product, which will then be manufactured to order as a bespoke item. The answers detailed are as a guide only. For more information, please call and ask to speak to one of our technical team regarding installation. If your query isn't answered here please get in touch. We can also provide you with a personalised quotation.